Many women today feel they are expected to be everything to everyone. They are expected to be a loving wife, a devoted employee, a caring friend. A committed citizen and a perfect mother; always making sure those around them are happy, well-fed and supported. They are expected to be taking care of things at home; packing school lunches and booking dentist appointments – and at the same time excelling at work; climbing that career ladder. With so many obligations and the pressure to be perfect, it’s no wonder self-love and self-care tends to slip further and further down the priority list for many. However, as the wonderful actress Lucille Ball once said: Love yourself first and everything else falls into line. You really have to love yourself to get anything done in this world. Essentially, in order to help others, you must first help yourself. It’s incredibly easy to go through life pouring love into others, without ever realising that we are not feeding ourselves that same love. But if you don’t look after yourself, in due course you won’t be able to look after those around you either due to stress, anxiety and you may end up getting burnt out. By choosing to love and care for yourself you are able to spread that same love and happiness to those close to you. Here at Tesoro we are very passionate about self-love and believe it all starts with ourselves – after all, you can’t pour from an empty cup. Self-love is all about appreciating yourself and recognising your worth and all the good that you do in this world. It’s about treating yourself to the same kindness, respect and empathy that you give to others. It’s about talking to yourself like you do to your friends: about encouraging and supporting yourself. It’s very much about nurturing the bond you have with yourself – after all, that is the most important relationship you will develop, and the only relationship that is guaranteed to be with you for the rest of your life. So, how does one practice self-love? Become more mindful! Listen to the voice in your head and the state of your thoughts, what are your thoughts saying? Be mindful of what you think, feel, and your wants and needs. Be aware of the present moment and try not to get caught up in thoughts – especially negative chit-chatter. Meditation is the most powerful way of training your mind not to listen or engage in pessimistic thoughts and feelings. Start meditating; even 5 or 10 minutes a day can do wonders. If you are new to the practise of meditation and it seems overwhelming or too difficult, try using guided meditation apps which gently lead you through the session. Self-care is immensely important to humans and it looks different for each and every one of us. Is self-care to you simply getting enough sleep, or getting outside to enjoy a nature walk? Maybe your kind of self-care is having some quiet alone time, or spending time with friends? Or perhaps just taking a long relaxing bubble bath, or a glass of red wine and some online shopping. Take a moment to recognise what self-care is to you, and try to incorporate a little more of those elements in your life. Notice and become aware of your own thoughts, feelings and emotions. What does that voice in your head say? Is it criticising and condemning? Is it doubting or fearful? You need to be self aware and conscious of your thoughts and feelings in order to train your mind to let go of any unhelpful thinking patterns. Look at all the things you do have, instead of what you don’t have. Start a gratitude journal where you note down 3 things you are grateful for about your life and yourself, a few times a week. It trains your mind to see the beauty in your life – and in you. Challenge and Believe in Yourself. You are much more capable than you think, you just have to believe it! Believe in those capabilities and challenge yourself to do new things. When you try new things your confidence will grow and so will the love you have for yourself. We all make mistakes, no one is perfect. Remember, perfection is nothing to strive for, rather aim for improvement. Forgive yourself for any mistakes that you make and always talk to yourself kindly. You are only human, and you are doing the best you can. Set Boundaries and Protect Yourself. Set limits in your life and start saying no. Reflect on what your personal boundaries actually are; and start enforcing them. You will love and respect yourself more with clear boundaries – and people around you will as well. Recognise and Focus on Your Positives. Start recognising all the positive things about yourself, all the good that you do, and choose to see the good in every situation. Focus on what you do well instead of what you can improve on. Train your mind to see all the positives about yourself instead of the negatives. Aim to be Your Own Best Friend. Become aware of how you talk to yourself. If you wouldn’t say it to a friend – don’t say it to yourself. Aim to truly start loving yourself and who you are – and become your own best friend. Do things on your own, enjoy your own company, and try to motivate yourself with positive, enthusiastic thoughts, just as you would encourage your best friend. Indeed, the most important ways if practicing self-love revolve around your mind, body and soul, and finding your own true inner peace. But in addition to this you may also enjoy other ways of showing yourself love and appreciation. For example, by taking time out for yourself to relax and read that wonderful book, going on a solo-date to your favourite café for a flat white and some people watching, or purchasing a fresh bouquet of beautiful flowers. Or perhaps; treating yourself to some wonderful quality jewellery, which you can wear and treasure for years to come. 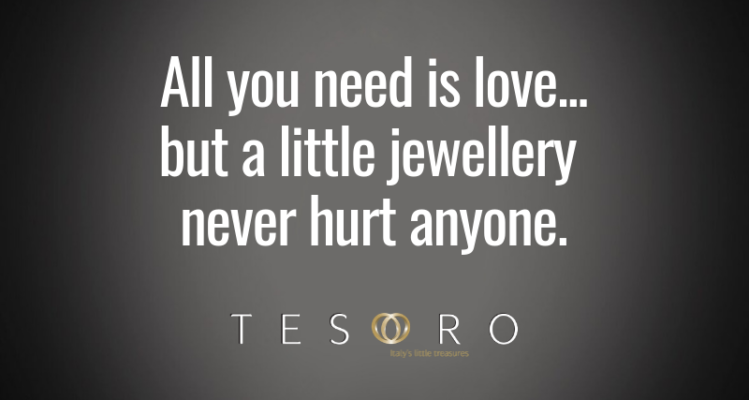 Here at Tesoro we love the idea of our jewellery as a form of self-care. To us and to many women around the world, jewellery is so much more than just a fashion accessory. It’s a cherished piece, full of meaning and significance. It’s brings memories, feelings and emotions. Regardless how big or small the jewellery piece is – it reminds us of a previous story and is a treasured souvenir of past and present times and experiences. Luckily gone are the days of women feeling they need to wait for someone else to buy them jewellery. If she sees a piece she adores – she will buy it for herself. Today, choosing and purchasing your own jewellery is a form personal, professional and sentimental statement. It’s an independent act of self-care and self-empowerment, which will last for years and years ahead. We truly believe jewellery is a beautiful declaration of love and recognition for oneself. Yes, self-love comes in many shapes and forms and is all about what makes you feel valued, loved and empowered. 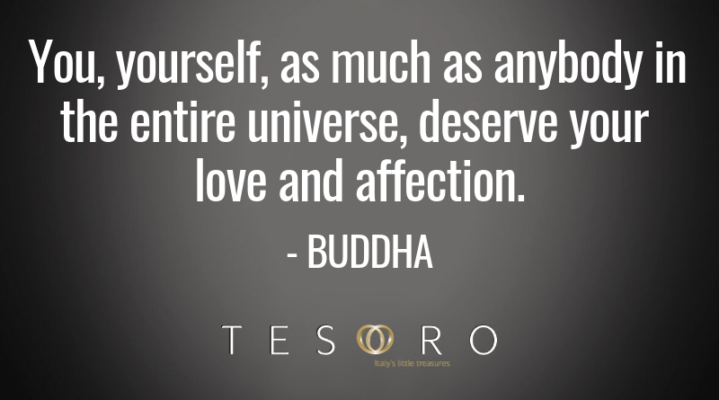 We at Tesoro sincerely believe self-love is the foundation for everything. So make yourself a priority today… Fill your own cup with an abundance of self-love and appreciation. Simply because you deserve it. 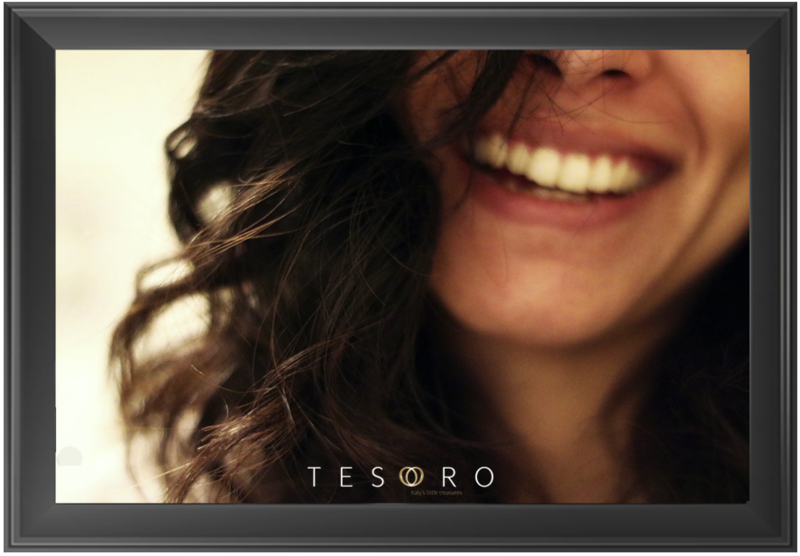 Tesoro Jewellery: Keeping Moments Alive.